According to the US Environmental Protection Agency, approximately 553,000 underground storage tanks (USTs) nationwide store petroleum or hazardous substances. The greatest potential threat from a leaking UST is contamination of groundwater, the source of drinking water for nearly half of all Americans. In New Jersey, the Department of Environment Protection oversees about 1,800 residential oil tank cleanups annually, but does not register the number and location of residential oil tanks. When purchasing an older home in New Jersey, the possibility of one or more abandoned underground oil tanks should be investigated. If a tank is found, regulations require that it be properly decommissioned and any contamination be remediated. Tank detection prior to purchase gives the buyer the opportunity to negotiate its removal and remediation with the sellers. Failure to investigate and detect an unknown oil tank means the buyer runs the risk of purchasing the tank and any contamination associated with it when they buy the home. Why should I choose THIS to perform my Oil Tank Sweep? We ONLY perform oil tank sweeps to detect the possible presence of an underground oil tank. We do NOT offer oil tank removal or remediation services. We therefore have no conflict of interest in additional oil tank business. If additional services are needed, we will refer our clients to qualified oil tank remediation companies. 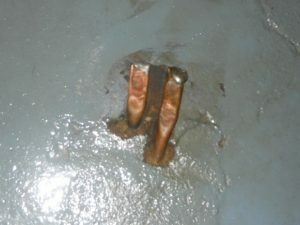 Other home inspectors may offer to perform oil tank sweeps when they perform the home inspection. We do not believe in being a “jack-of-all-trades and master-of-none.” Our tank sweep specialist ONLY performs tank sweeps, and has fifteen years of experience doing only that. Our home inspectors specialize in home inspections only, to give our clients the focused expertise they need. The home inspector and the tank sweep specialist will both be present for your inspection and perform their respective services concurrently, saving you time. How does THIS perform an Oil Tank Sweep? 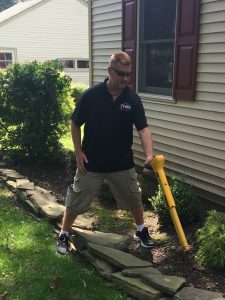 During a tank sweep our technician will search for previously disconnected oil service lines inside the home as well as vent pipes and fill valves on the exterior of the property. The technician will also scan the property using a Schonstedt Model GA-72CD and/or a GA-92XTD flux-gate type magnetometer. The magnetometer detects the difference between two sensors in magnetic field strength generated by ferromagnetic objects. The presence of a difference in sensor readings indicates anomalous conditions that are manifested by a signal meter indicating strength and polarity. Following your tank sweep, our technician will provide a report of the findings. Q: Is it necessary to access the inside of the home to perform an oil tank sweep? A: Yes. A thorough inspection of either the basement or the area nearest the furnace is essential to the oil tank sweep process, to investigate for evidence of previous fuel oil service inside the home. Q: Is it necessary to move cars parked on the driveway before doing a tank sweep? A: Yes. In order to get the most accurate sweep, cars need to be moved off the property. 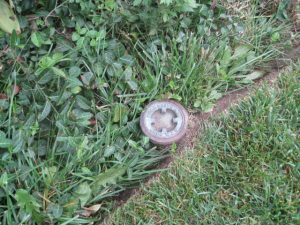 If metal objects cannot be moved off the property during the inspection, the area under them will be excluded from the report. Q: How much of the property does THIS sweep with the metal detector? A: THIS will typically sweep the entire property up to one acre. Some companies only scan a 30-foot area around the building during a tank sweep. THIS has discovered underground tanks that have been missed by other companies using more limited sweep areas. Q: Do I need to be there while you perform the oil tank sweep? A: No. A long as our technician can get access to the property from either the current property owner or realtor, the client does not need to be on site during the sweep.